We are in the 21st century where everything is changing for the better. Adults have had their life in another high level, thanks to the technology where they can do almost everything inclusive of shopping from their smartphones and tablets. Children have not been left behind as their lives have been transformed from a life full of toy cars and dolls to robots. Interestingly, it is not like before where children with a passion for robots were forced to join Robotic Clubs at schools and see coaches for approval; they can now get the robot kits in the market. How amazing!! Keeping this in mind, you might be confused on what is the best robot kit for your kid, but worry not as we got your back. Read more to understand which are the most popular robotic kits for kids. If your child has challenges in learning languages, Romobo is what he or she needs. With Romibo, children are well equipped to practice social skills and communication. It has a LED screen on its face, and even though it looks like a toy, it can show expressions according to how users design it. It has a front camera that captures the action of your kid, and both its movement and voice are controllable. It’s the best in delivering praise and prompts, in addition to telling stories. If your child is eight years and above, Wonder Workshop Dash Robot could work for him/her. It’s the most attractive robot for kids and excellent for those getting into coding, robotics, and making. It’s controlled using a free app for Android or Apple, where children program the Dash to make sounds, react to their voices, move, light up, avoid obstacles, and dance using their tablets or phones. If you are looking for an amazing but inexpensive robot kit for your child, 4M Table Top Robot is the answer. 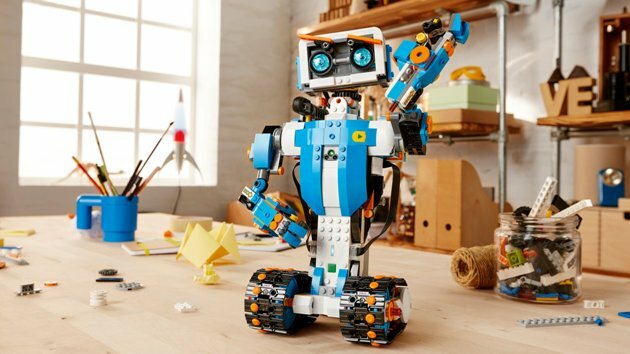 It is one of the easiest robot kits to assemble, and your kids will definitely enjoy building this clever and cool looking robot. It provides instructions on building, after which, you install the batteries and start it up. Its made with senses that make it appropriate to walk across the table without falling because on reaching the edges, it turns to a different direction. If your kid has not had any robot kits before and has reached nine years, then it will be good to introduce him or her with 4M Table Top Robot. Thames & Kosmos Remote Control Machines are suitable for children aged eight years and above. It comes with everything you need to build as many as ten machines. It makes your kids to critically think on how to use the available pieces and build even more machines. It also comes with an infrared remote control that makes it possible for your kid to control three different motors simultaneously after finishing the building, and this creates fun. Ozobot is suitable for children aged five years and above. It’s an incomplete toy that acts depending on how you program it. If you want your kids to develop programming and logic skills, Ozobot is what they need. It can either dance or move around according to how your kids direct it. When kids draw color-coded line patterns on paper, Ozobot, with the help of sensors identifies them and move along these lines.